The American Society of Addiction Medicine (ASAM) 48th Annual Conference is the nation’s premiere conference on the latest science, research, best practices and innovations in addiction medicine. This year’s meeting was held April 6-9th in New Orleans, Louisiana. In addition to symposiums, poster sessions and workshops ASAM members took time on Sunday, April 9th, to recognize several of their members, among them UF Department of Psychiatry Professor and Director of UF Health Florida Recovery Center, Scott Teitelbaum, MD. 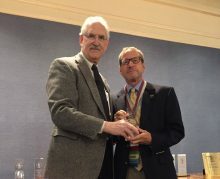 Dr. Teitelbaum was recognized by ASAM for his contributions as the Vice Chair of Public Policy. Dr. Teitelbaum served as Vice Chair from 2011-2017. The Public Policy Committee advises on public policy issues the committee feels should be addressed by the Board of Directors.